Voters approved two propositions for an $11.48 million bond for the Davis School District on Tuesday, which will help with construction/remodeling and transportation. "The projects we have on this bond are all things that we need," said Superintendent Todd Garrison on Thursday. "We are elated." Garrison said there was a strong group in the community that worked hard to create awareness about the bond and he is proud of the community and the school. 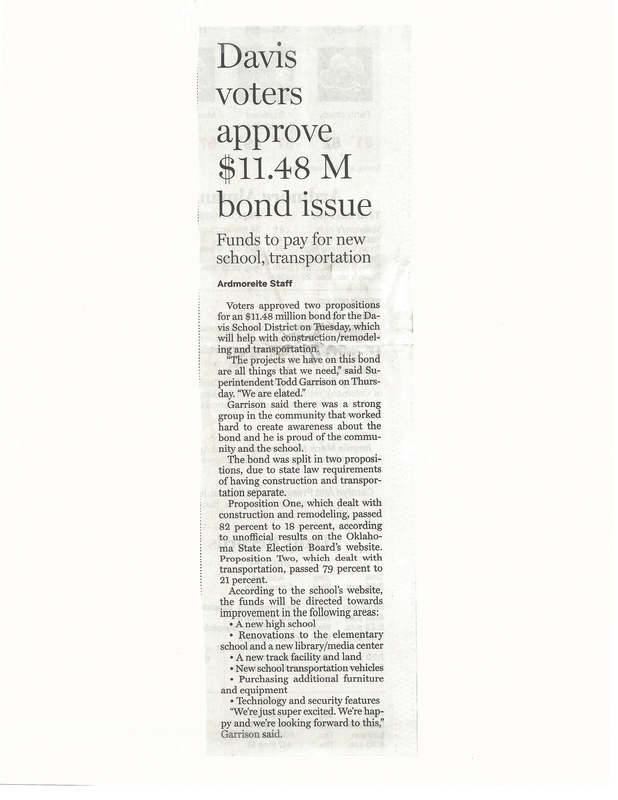 The bond was split in two propositions, due to state law requirements of having construction and transportation separate. Proposition One, which dealt with construction and remodeling, passed 82 percent to 18 percent, according to unofficial results on the Oklahoma State Election Board's website. Proposition Two, which dealt with transporation, passed 79 percent to 21 percent. "We're just super excited. We're happy and we're looking forward to this," Garrison said.